Elements from self-determination theory are somewhat known to many people. Particularly, the terms intrinsic motivation and extrinsic motivation are familiar to many people. Also reasonably well-known are the basic psychological needs of autonomy, competence, and relatedness. Recently someone said to me: "I have heard of several elements of the theory but I find it hard to get a good overview of the it." If you feel the same, the picture below may be useful for you. 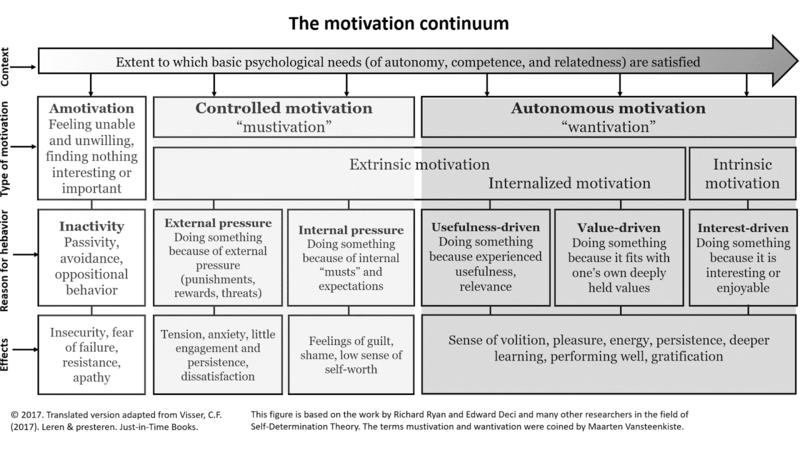 It is my most recent version of the so-called motivation-continuum. There are many version of this model in circulation and they are all variations on and extension of the original version by Ryan & Deci (2000). 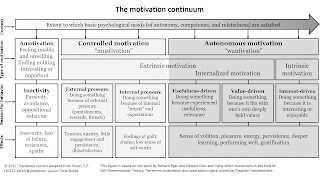 In the picture below I show which types of motivation emerge in which contexts, and what their effects are on our behaviors, emotions, and performance (click to enlarge).